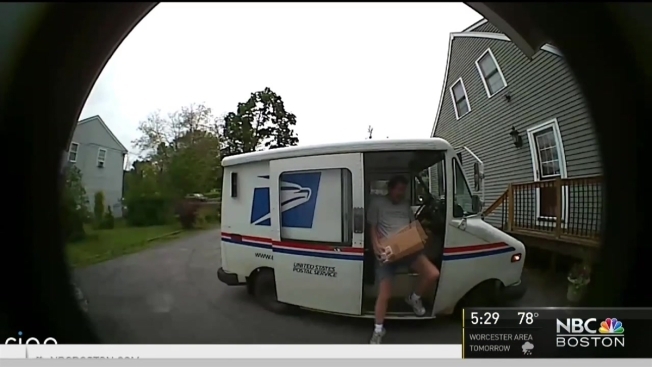 Peter Kerrigan was caught on camera swearing and hurling a family's mail onto a deck in Littleton, Massachusetts. The U.S. Postal Service is taking action after an aggressive incident with a Massachusetts mail carrier. The family turned to the NBC Boston Investigators for help - and got it. The Littleton mail carrier has been barred from interacting with the public, at least for now. It all stems from an incident back in May. Mail carrier Peter Kerrigan was caught by the family’s new security camera swearing and hurling their mail onto their deck. The video showed him throwing a package of teak oil that cracked and leaked. The family said they had been complaining to the post office for years about Kerrigan's rude behavior, lost mail and damaged packages. But they weren’t seeing much improvement. The family said they've never had a disagreement or argument with the mail carrier that would have caused him to react in this way. The postal service called Kerrigan's behavior "unacceptable," and said he will not interact with the public while they conduct their investigation. They would not say how long that could take.